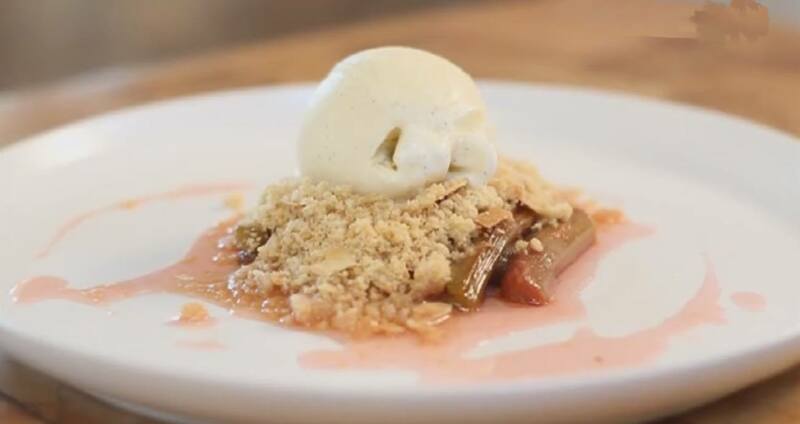 The video shows how to macerate the rhubarb prior to cooking as well as the fast way to a perfect crumble in the processor, ending by assembling the dish. 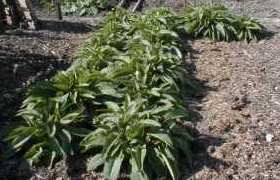 Maceration is explained – cooking without heat – in the video. The addition of lemon and ginger just enhances the rhubarb to another level. Whether you’re buying the wonderful, tender, Yorkshire forced pink stems between Late December and the end of March, or the field-grown between April and September; this recipe is a lovely little de-constructed version of the whole baked crumble. Pre-heat the oven to 170˚C. Place the first 4 ingredients in a non-reactive saucepan, covered with a lid and leave to macerate for about half an hour. Meanwhile prepare the crumble topping: place all the crumble topping ingredients, except for the flaked almonds in a food processor and pulse until combined and formed into crumbs. Spread the crumble onto a baking sheet and add the flaked almonds, mixing in well. Once the rhubarb has macerated, bring to a simmer on the hob over a medium heat and then transfer, lid on, to the oven and bake for 10-12 minutes. 7 minutes before the rhubarb is ready, place the crumble topping in the oven. Divide the rhubarb between 4 warmed plates, spoon over, and around a little of the pan juices. Top with the baked crumble topping, and serve with a scoop of vanilla ice cream.